The winter season has begun in our country and the temperature in most of the states has dipped by 10 or 15 degrees. People who are living in South, East or Western part of India are not used to the cold conditions, but those who live in the North are. No matter where a person lives, during the winter or monsoon season, most people will cover themselves with two or three thick blankets. When the person wakes up in the morning, he’ll be soaked in sweat. When you sweat a lot during the night, you may suffer from dehydration. Sometimes, you might wake up in the middle of the night. To sleep peacefully during the monsoon or winter season, you can buy a room heater. Room heaters consume more energy than other household appliances such as LED televisions, refrigerators, but they help you sleep better in the cold. Morphy Richard is an 81-year-old UK firm that has launched 100s of home appliances till date. Its products are quite popular in India. MR 6F room heater has a spectacular design and it is ideal for small or mid-sized rooms. It consumes up to 2000-Watt power and has a knob to adjust the heating. The Morphy Richards 6F room heater features an oil-filled radiator. It has a smart circuit that prevents room overheating. MR had launched the 6F room heater last year in India for Rs 9999. It is retailing for Rs 6999 on Flipkart. Blow Hot is a great device for the people who are looking for a durable and cheap room heater from an Indian firm. The Bajaj Room heater has a design that resembles a cardiac monitoring system in the hospital. Nevertheless, it is a great device. Blow Hot weighs about 3.6 kilograms. Although it is compact, BH packs a lot of punch. The Blow Hot room heater consumes 1000 or 2000 Watts power. To make sure that the heat waves cover evenly in the room, the heater has a fan built-in. Bajaj BH is ideal for rooms having an area of 500 Sq Ft (or less). It is priced at Rs 1999. It carries 2 years warranty. RX11 is top-rated convector type heater from Bajaj. It features a thermostat device which does a great job of controlling the room temperature. RX11 has been designed to last long. Many people are using RX11 for 4 to 5 years without complaining about the device. RX11 has a nice design and is portable. It has buttons to control humidity and temperature. Bajaj is selling RX11 for Rs 2599 with a warranty of 1 year. OEH-1220 is the cheapest room heater in India with a fan. Although it is a powerful compact heater, OEH-1220’s chassis remains cool when it is on. OEH-1220 has a tip-over switch that supports connectivity with a 15 Ampere switch. The heater has two buttons. If you press button 1, OEH-1220 will consume 1000-Watts. The other button will make the heater consume up to 2000-Watts power. For the safety of the user, OEH-1220 features a thermal-cut off module. According to Orpat, OEH-1220 is ideal for small 250 Square Feet rooms. The heater costs Rs 999. It is available for purchase in white color option. It carries 365 days warranty. The 3002-QH heater features two heating rods that consume 400-Watt power. It supports three heating modes. It has a power button fitted with a spring. You don’t have to press the power button. When you place the heater upright on a table, the heater will be turned on. To turn off Usha 3002, place it horizontally. 3002-QH includes a LED indicator which indicates the heater’s status. It weighs about 6 kilograms. It includes a tip over switch. As the Usha room heater doesn’t include a fan, 3002-QH won’t make noise. Hence, you can sleep peacefully after turning on the heater. Flashy is a cheap radiant type heater for small rooms. It boasts a nickel plated metal grid (mesh) and chrome-nickel reflector. Like other heaters we’ve shared here, Flashy ships with a safety module that turns off the heating rod/element automatically to prevent room overheating. Bajaj Flashy is compact and has a strong built. 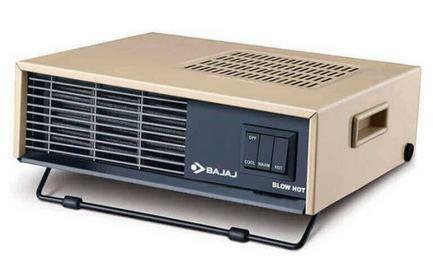 Bajaj has fitted its heater with a 1-meter cable. It is stylish and consumes 1000-Watts energy. Flashy is portable as its weight is 1.5 kilograms. It carries 730 days warranty. It costs 850 Rs. Conclusion: Morphy Richards 6F, Bajaj Blow Hot, Majesty RX11, Orpat OEH-1220, Usha 3002-QH are the best water heaters in India.